Even undisputed classics benefit from a fresh approach at times. With that attitude of experimentation in mind, it’s time to take the much-beloved Negroni into the lab. No cocktail concept is out of bounds here: The Negroni’s free to wade in strange waters, taking the plunge into frozen territory or fiddling around with fizz in a whipping siphon. Spiced, infused and even solidified, your Negroni is ready to let loose in these new-age variations. Campari still creates the bitter framework of this complex ’tail, but from there, things get a little funky. Just like any good mole, this recipe is at once sour, sweet, savory and bitter—not to mention dark and brooding. How to achieve mole’s trademark nuttiness and depth of dark chocolate in drinkable form? Black walnut liqueur. Set in motion along with sweet vermouth, Ancho Reyes liqueur, mezcal and mole bitters, this glass could almost pass for a smoky, scratch-made plate of mole—for when you need your fix in a fraction of the time. Get the recipe. Don’t fight it. No one can resist the siren call of a slushie. All the better if that slushie packs a welcome dose of watermelon-infused gin. That subtly sweet gin is frozen together with Cocchi Americano and dry vermouth and then blended into icy oblivion, creating a slush that’s as white as snow—if perhaps a little less pure. Get the recipe. In the rare event that you’ve kicked your bottle of vermouth but have fresh beets at the ready, this is the moment to show off your juicing skills. Inky red beet-carrot-apple juice is an earthy stand-in for sweet vermouth in an otherwise typical Negroni lineup. Garnish with an apple slice and witness your friends’ magenta concern turn into gleeful surprise. Get the recipe. The next Negroni frontier lies ahead, and it’s paved with popsicles. Fear not, stick skeptics: Frozen cream is a natural cohort for the bittersweet cocktail. Spruced up with fresh orange juice, cream and club soda, the classic Negroni components freeze into a pleasingly adult version of an after-school creamsicle. Get the recipe. Carbonation can generally do no wrong. That truth remains steadfast in this fizzy twist on the Negroni, made with an eclectic gang of Campari, Old Tom gin, Punt E Mes, byrrh and orange bitters. Byrrh is a red wine and quinine aperitif that lends additional bitter and floral notes. When this motley crew is charged in a whipping siphon, the emerging elixir is a bubbly distant cousin to the original cocktail. One that should definitely be invited to family functions more often. Get the recipe. You’ve just hit the BOGO jackpot. 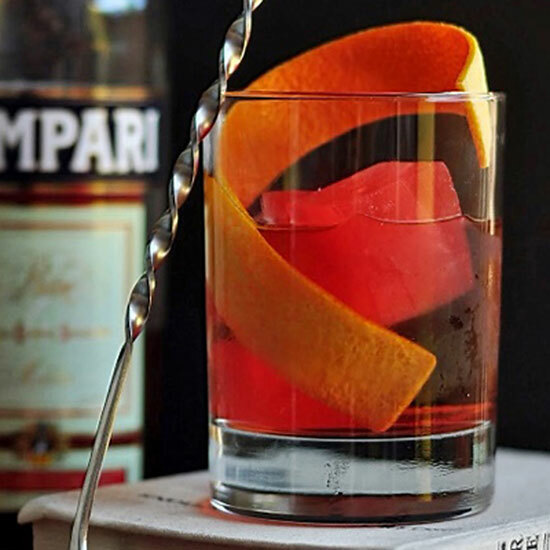 What starts as an ordinary Martinez slowly swirls into a Maraschino-licked Negroni, thanks to a few Campari ice cubes. The melting red cubes create a wizardly effect, merging two distinct cocktails in one glass that tastes fresh with every sip. Get the recipe.